A rod with a standard spin-cast reel and small tackle box with supplies is included. CAPE GIRARDEAU, Mo. -- The Missouri Department of Conservation (MDC) has a free Rod and Reel Loaner Program for those who want to fish, but don’t have the equipment. This week, MDC added six new options in southeast Missouri through the Riverside Regional Library System’s locations in Jackson, Scott City, Benton, Altenburg, Oran and Perryville. 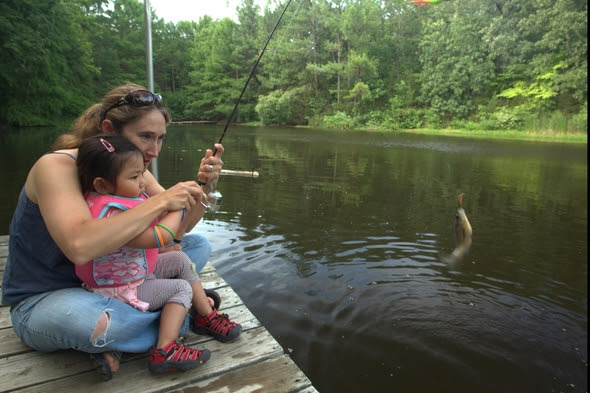 MDC’s Rod and Reel Loaner Program offers free “loaner” fishing gear at more than 100 locations around the state, including many libraries, MDC offices and nature centers, some state parks, and several marinas. For a list of MDC Rod and Reel Loaner locations, visit MDC online at mdc.mo.gov/RodandReelLoanerProgram. In addition to getting a rod with a standard spin-cast reel, MDC also provides a small tackle box with hooks, sinkers, bobbers, and a stringer to hold the catch. Anglers need to bring their own live bait or desired lures. MDC started the program in 2014 and now offers more than 4,000 sets of fishing gear at 100 locations around the state -- including many libraries. The Mid Continent Public Library in Smithville recently became the 100th loaner location, and more are being added. Organizations in several communities have partnered with MDC to provide equipment. According to MDC, conservation makes Missouri a great place to fish for more than a million anglers and brings hundreds of millions of dollars in related revenue to communities in Missouri each year. “Our free Rod and Reel Loaner Program makes it even easier for more folks to get hooked on fishing,” Jansen added. For more information on fishing in Missouri, including public places to fish, regulations, seasons, what to catch, fishing tips, and more, visit MDC online at mdc.mo.gov/fishing.